There are several reasons for studying the ancient Lao kingdom of Lan Xang. 1. It was one of the main states that emerged after Khmer Empire began to contract in the 13th century, and it thrived for many centuries alongside the ones that developed in Thailand. 2. 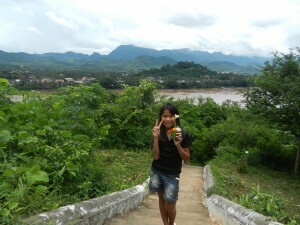 Lan Xang was part of a big international trading network. Luang Prabang was its capital (across the Mekong in the above shot), and it grew between the great northern Thai kingdom of Lan Na (based in modern Chiang Mai) and Yunnanese cultures around Lijiang. So Lan Xang was a major cultural crossroads for societies all over mainland Southeast Asia. 3. The natural scenery and art around Luang Prabang are so beautiful that most people who go there never forget them. So we’ll take a brief look at how this kingdom emerged. A strongman named Fa Ngum established the kingdom of Lan Xang, became its ruler and made Luang Prabang its capital in 1353. 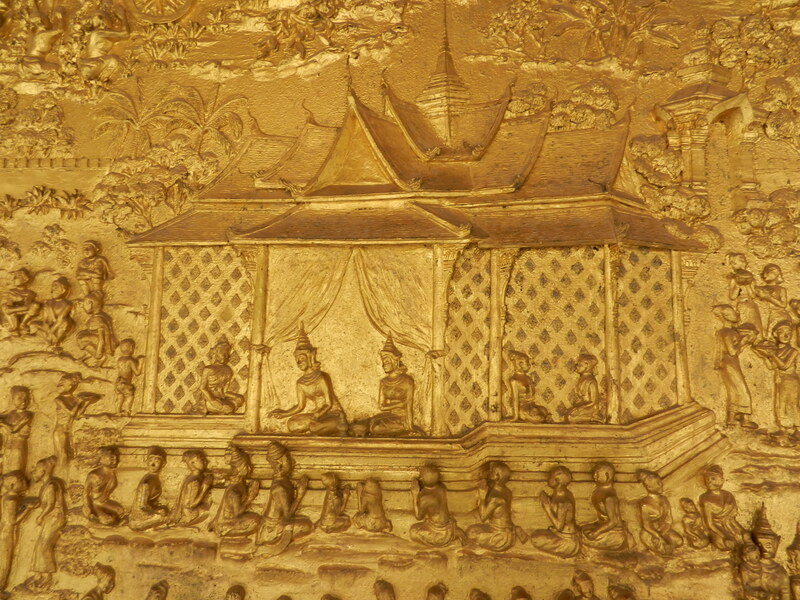 Fa Ngum was the son of a Thai prince, and he was raised at the Khmer Empire’s court down in Angkor. The buildings in the above photo stand across the parade ground from the Khmer royal palace. The one on the left (called a khleang) might have been used to house distinguished guests. 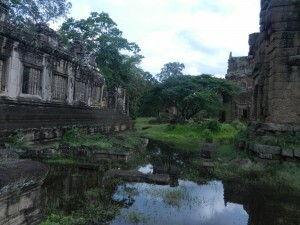 The splendor of Angkor’s court must have made a huge impression on the young Fa Ngum. 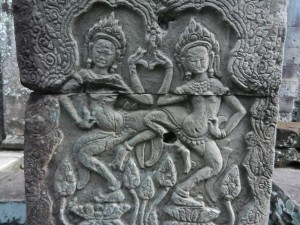 Khmer ideas of beauty also enchanted him–he married a Khmer princess named Keo Kaengkanya. 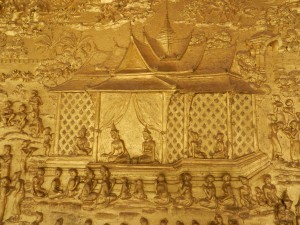 Her father and Angkor’s king, Phaya Sirichanta, gave him a golden Buddha statue called the Pra Bang Buddha. 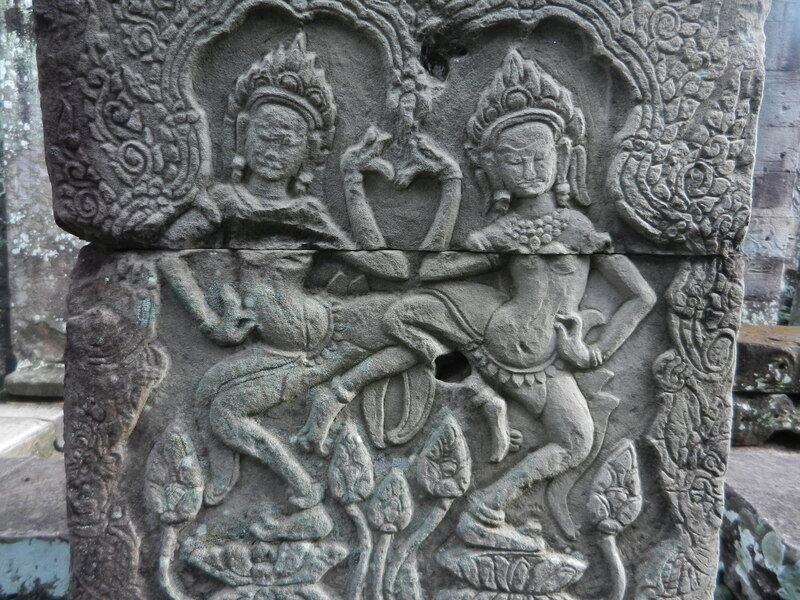 People thought it came from Sri Lanka, but its style is 13th century Khmer. So when Fa Ngum established his northern kingdom, he took models of regality from a mighty empire that Lan Xang in its mountainous and landlocked territory never could have emulated. But the Lao kingdom was still integrated with ideas of sacred authority. Fa Ngum is said to have descended from sky god Khun Borom, and people saw the Pra Bang Buddha as the Lao kingdom’s protector. Folks in Laos still revere it. 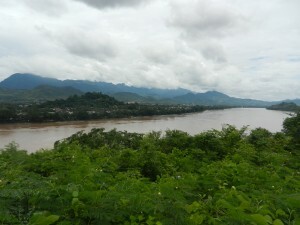 This blend of majesty and mountains must impressed the locals around Luang Prabang. But Fa Ngum died in 1373 and his son, Sam Saentai, became king. He ruled until 1416, and he took Lan Xang into new directions. Fa Ngum’s rule had largely been based on personal loyalties, but Sam Saentai built a beaurocratic system and trade grew. The kingdom of Lan Na was enjoying its heyday and it had increasing influence on Lan Xang art. Lan Xang was remote, but it unified itself and grew by integrating two very different cultures. Khmer glory and northern Thailand’s humanistic art blended with each other, and with Luang Prabang’s beautiful natural environment into a unique cultural landscape, We’ll explore it when it reached its heights in the next post.